Mt. Rushmore, Black Hills. Source: Wikimedia Commons. American “Manifest Destiny” it embodies. Visitors are unlikely to learn about the broken treaties that enabled the U.S. government to confiscate the Black Hills, because sermons of injustice tend to put a damper on more exciting stories of American liberty and rugged individualism. Gutzon Burglum, known for his sculpture of Lincoln’s bust in D.C.’s Capitol Rotunda, supervised this colossal project from 1927 until his death in 1941, and then turned over to his son to complete in the following year. Since Mount Rushmore’s completion, however, its precarious place in the landscape of the Black Hills sparked a debate about the importance of representation and context of monuments. The Native American Netroots blog provides an Indigenous interpretation of the way the monument desecrates the Black Hills, better known as Ȟe Sápa, “The heart of everything that is,” in Lakota Sioux culture. According to the article, Mount Rushmore resides on stolen property and symbolizes “the dominant culture’s arrogance, racism, and spiritual insensitivity. Carving icons of Presidents who were known for their insensitivity to Indian issues into a living sacred mountain would be similar to painting anti-Christian graffiti inside of a cathedral, or anti-Semitic symbols inside a synagogue.” The defacement of the Black Hills without concern for the Lakota Sioux begins a story of tribal efforts to reassert its presence and challenge the meaning of Mount Rushmore. Just seventeen miles from Mount Rushmore, the construction of the Crazy Horse Memorial proceeds at Thunderhead Mountain and could become the world’s largest sculpture upon completion. Korczak Ziolkowski began this project in 1948 after travelling to the Black Hills a decade prior to assist Gutzon Burglum on Mount Rushmore. During this period, Ziolkowski sparked the interest of a Lakota Chief named Henry Standing Bear who wanted to create a memorial designed to honor the Lakota warrior Crazy Horse as a symbol for all Indigenous defenders and survivors of violence and injustice. Unlike Mount Rushmore’s funding and maintenance through the National Park Service and federal sponsorship, the Crazy Horse Memorial depends solely on private funding, donations, and visitor fees to uphold its Indigenous, grassroots vision. Unfortunately, this led to consistent delays due to a lack of funding, especially in the years following Ziolkowski’s death in 1982. Since then, his wife, children, and grandchildren continue working on the Crazy Horse Memorial through the Crazy Horse Memorial Foundation . This non-profit organization upholds Henry Standing Bear’s vision to foster Indigenous cultural heritage and community involvement to broaden the historical context of Mount Rushmore. However, this project has its own share of controversy. In the last twenty years, an explosion of online journals and news articles brought the memorial into an even larger arena for public debate in the digital age. Concept Model of Crazy Horse Memorial. Source: Wikipedia. The Los Angeles Times published an article in 2007 comparing Mount Rushmore and the Crazy Horse Memorial. Journalist Christopher Reynolds described his difficulty in coming to a conclusion on which monument was better, even after interviewing visitors to both monuments. Whether Reynolds intended it or not, he viewed the proximity of Mount Rushmore and the Crazy Horse Memorial as elements part of the same historical fabric, acknowledging the defense of Indigenous peoples against the waves of violence, settlers, military, and Indian policy. CNN published a similar article critiquing both the endless construction and the interpretation of the memorial. Journalist Martin Rand III claims that while public reception of the Crazy Horse Memorial has been better since its early days, people are most anxious for its completion to have a deadline. Furthermore, some members of the Lakota community disagree with the design of Crazy Horse because no known photographs of the famed Lakota warrior exist. In response to this dispute on the monument’s appearance, the Memorial Foundation ensures that the sculpture represents the “spirit” of Crazy Horse and the persistence of all Indigenous peoples. Patrick Dobbs, a spokesman for the Crazy Horse memorial spoke with CNN stating the “significance of the Crazy Horse Memorial and reaction to the mountain carving varies” among Native Americans. Perhaps most troublesome are the allegations that the Memorial Foundation is slipping away from the original vision of Henry Standing Bear by focusing their attention on a visitors’ center, gift shops, restaurants, and a cultural center. Voice of America, the largest, federally-funded U.S. International Broadcasting institution, further revealed the Lakota’s concerns about the memorial’s slow construction . To some, the unfinished appearance of the monolithic statue is more of a liability than an artistic message about Indigenous perseverance. Other Lakota members find flaws with Henry Standing Bear’s original vision. The article cites Elaine Quiver, a descendant of Crazy Horse, who argues that Henry Standing Bear did not consult Crazy Horse’s family or incorporate other tribal members in his decision to commission Ziolkowski for the memorial project. The consent to use Crazy Horse’s legacy and memory is a necessary norm in Lakota culture and values the consideration of descendants. Quiver states, “They don’t respect our culture because we didn’t give permission for someone to carve the sacred Black Hills where our burial grounds are […] it wasn’t meant to be carved into images, which is very wrong for all of us.” Despite being an Indigenous response to Mount Rushmore and challenge the lack of Native representation in historical settings, the Crazy Horse Memorial has not been a smooth journey. For Elaine Quiver and others who believe that the Crazy Horse Memorial Foundation sidestepped Lakota involvement, their greatest concern is whether the project’s leadership will fulfill its obligation to serving Lakota interests. Despite the fact that the Crazy Horse Memorial perpetuates the continued defacement of natural and sacred spaces, it serves as a response to Mount Rushmore in a way that reclaims the space and narrative for the Lakota. Putting Mount Rushmore and the Crazy Horse Memorial in conversation with one another exemplifies broader discussions on the way memorials serve to inform the public and who controls the production of the narrative. The wave of recent debates about the dilemma of Confederate memorials sparked similar concern over the dangers of idolization, how the public consumes history, and whether removal meant historical erasure. These fears expanded to include other memorialized figures in American history, like Christopher Columbus. An article from Voice of America consulted Native sources to provide a comprehensive list of memorials and statues which incite racism against Indigenous peoples and why they are problematic. Unsurprisingly, Mount Rushmore appears midway through the article, but there is no acknowledgement of the contextualization provided by the Crazy Horse Memorial. The historical and spiritual meaning of the Black Hills to the Lakota Sioux is critical to understanding the significance of the Crazy Horse Memorial as a form of repatriation. Anyone who visits the Black Hills and Badlands will see an impressive geographic wonder with unusual rock formations and ponderosa pines erupting in the middle of prairie grasslands. The Lakota interpret the unique geological features to have immense spiritual power which signifies a profound connection between the Lakota and Grandmother Earth. For example, the Wind Cave within the Hills received its name from the way wind flows into the cave during high air pressure, or out of the cave during low air pressure. This resemblance of inhaling and exhaling became a significant part of the Lakota creation story, which believes that humans and bison both emerged from this cave. Historians and anthropologists who study Indigenous cultural transformation in historical contexts provide an avenue to help others understand the sacred meaning of the Black Hills. Jeffrey Ostler, a renowned scholar of the American West and Plains Indian history, provides this missing context in The Lakotas and the Black Hills: The Struggle for Sacred Ground. This work strings together multiple perspectives while centering the significance of Lakota cultural interpretations through a close examination of primary and secondary source materials.The book opens with Mount Rushmore and its problematic symbolism of America’s ownership of both the Lakota’s Black Hills and the continental empire at large. For Ostler, the Black Hills occupy a precarious space both physically and historically. As a result, the interactions and perspectives of both Euro-Americans and the Lakota yield a combination of different historical narratives that will influence ongoing disputes about the usage of land in the Black Hills. Historically, the Black Hills served as a shelter for various Lakota bands in the winter, provided ample hunting opportunities, and hosted a variety of ceremonies that spiritually connected the Lakota to the land, including the Sun Dance and sweat lodges. As federal and settler interest in the region grew, a series of fragile treaties were designed to secure the land from the Sioux. Despite the Lakota’s diplomatic efforts to keep their access to the Black Hills and resist land reduction, the U.S. was set on a course which championed the development of the West through land dispossession and resource extraction. Jules Tavernier, Sioux Encampment, Oil, c. mid-nineteenth century. Source: Wikimedia Commons. Rumors of precious minerals in the Black Hills exacerbated encroachment from the 1840s through the 1860s, and the Lakota quickly realized the need for legal and physical defense of their lands. Ostler claims that previous historians “have been critical of Lakotas who took up arms against the United States, applauding those who recognized the futility of armed resistance and accepted the ‘realities’ of U.S. power.” Importantly, however, Ostler devotes most of his book to explain the variety of the Lakota’s defense tactics against the U.S. which demonstrates their power as active participants. 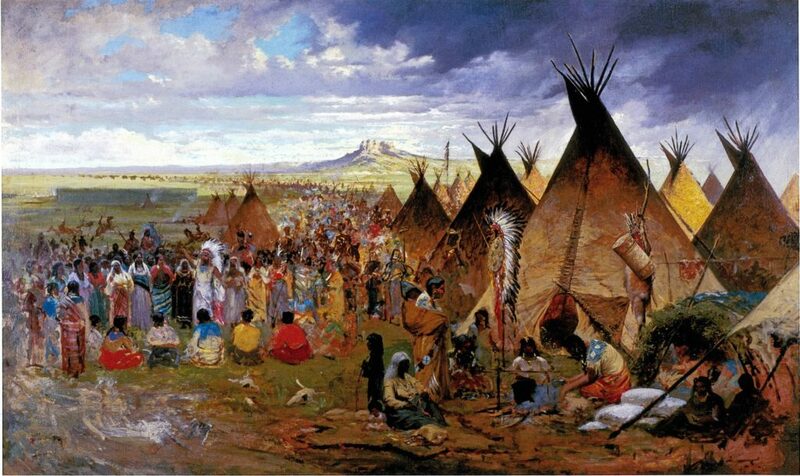 The Fort Laramie Treaty of 1868 is an important historical marker to the Lakota which supposedly guaranteed their possession of the Black Hills. However, officials did not fully explain or translate the contents of the treaty which included the presence of at least one white teacher, blacksmith, farmer, and agent on the reservation to implement assimilation. Also, agents did little to enforce the treaty’s protection of the Black Hills and spurred violence between the Lakota and intruders. Harney Peak, Black Hills. Source: Wikimedia Commons. 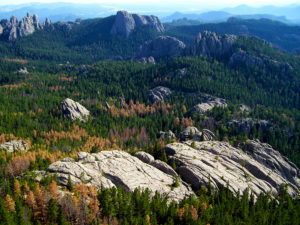 In the early 1870s General Philip Sheridan sponsored a reconnaissance expedition of the Black Hills to survey the region’s geography and resources. Lieutenant Colonel George Armstrong Custer led the expedition which quickly revealed numerous gold deposits and sparked interest in settlers eager for “get rich quick” schemes. In 1876, the Manypenny Commission officially secured U.S. ownership of the Black Hills without fair compensation to the Lakota Sioux. Increased militarized violence erupted between the settlers and the army, culminating in Custer’s famous “Last Stand” at the Battle of the Little Bighorn (1876) and the death of Crazy Horse at Fort Robinson one year later. As a result of amounting danger, some bands of Sioux found sanctuary across the Canadian border while those unable to escape felt the heightened force of restrictions on reservations. Ostler’s The Lakotas and the Black Hills traces how these conflicts yielded numerous legal initiatives from the Sioux and other Native peoples to address broken and unfulfilled treaties. Following the passage of the Indian Reorganization Act (IRA) or the “Indian New Deal” in 1934, the Lakota collaborated with other tribes in the fight to reacquire lands that were unjustly taken from their possession. The enduring battle for Indigenous recognition and sovereignty as a result of 19th-century decisions is the exact historical context absent from Mount Rushmore, which began construction just a few years before the IRA . While Ostler’s work reveals the dark history behind the Black Hills and problematizes the Mount Rushmore Monument, it is also a story of Native agency and resistance. 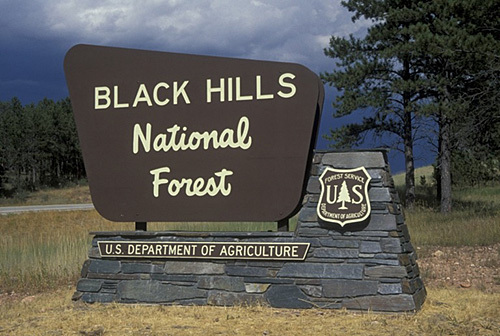 The legal battle over the Black Hills continued until an unofficial conclusion in 1980, when the U.S. Supreme Court acknowledged a violation of the 1868 treaty for unfair compensation and offered $102 million to the Lakota. The Lakota rejected the money and it remains unclaimed and gaining interest. Naturally, the rejection elicited confusion among those who closely followed this litigation. For the Lakota, however, this fight was never about compensation for the land, but rather the recognition that it rightfully belongs to them. So long as Mount Rushmore occupies its 1300 acres, it remains on stolen land. 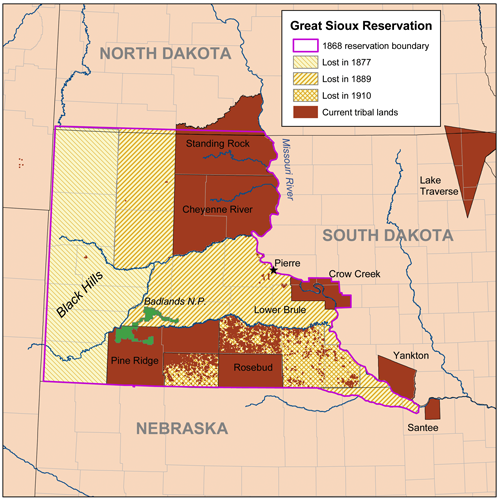 Map of the Reduction of Sioux Lands. Source: Wikimedia Commons. According to Ostler, the Black Hills have always carried a special legacy for the Lakota and they will continue to develop new initiatives that reinforce their commitment to preserving Ȟe Sápa. However, real success will depend on non-Natives “to accept Lakota aspirations to regain at least a portion of the Hills.” Other solutions, like the construction of the Crazy Horse Memorial, begin to complicate a longstanding historical narrative and inspire people to mindfully critique their nation’s history. 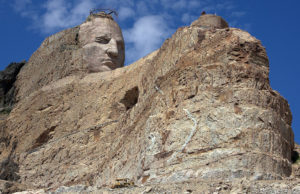 Upon completion, the head of Crazy Horse will be nearly 27 feet higher than the presidential heads at Mount Rushmore, and will become the largest sculpture in the world with an even larger message. As a result, visitors to the Black Hills will see how multiple histories occupy the same space and think more introspectively about U.S. history. For the Lakota and other Native peoples which the Crazy Horse Memorial represents, there is an even more powerful lesson in the way history, culture, and identity are entwined. In this sense, the Black Hills continue to be a powerful spiritual metaphor; a contested symbol and space stamped with competing notions of ownership and recognition. The competition of these notions end once Americans begin to view Mount Rushmore and the Crazy Horse Memorial as occupying the same narrative with equal amounts of influence. Jen Andrella is a Ph.D. student in the Department of History at Michigan State University. 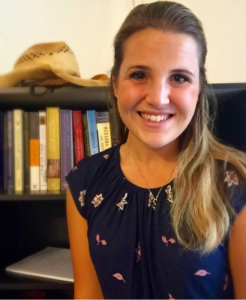 Her research focuses on nineteenth-century territorial development of the American West, violence against Indigenous peoples, and its connections to the politics and policies of the Reconstruction Era. Her interests also include ethnohistorical approaches that incorporate non-traditional documentary evidence like art, literature, and music which allows stronger representation of Indigenous culture and memory. “Carving History” National Parks Service, accessed October 22, 2017. https://www.nps.gov/moru/learn/historyculture/carving-history.htm. Jeffrey Ostler, The Lakotas and the Black Hills: The Struggle for Sacred Ground (New York: Penguin Group, 2010), xiii-xiv. “Crazy Horse Memorial FAQ,” Crazy Horse Memorial Foundation, accessed October 26, 2017, https://crazyhorsememorial.org/faq-main.html. 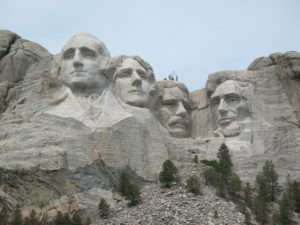 Christopher Reynolds,“Faceoff: Mount Rushmore vs. the Crazy Horse Memorial – LA Times,” Los Angeles Times, August 12, 2007, accessed October 20, 2017. http://www.latimes.com/travel/la-trw-dakota12aug12-story.html. Martin Rand III, “A memorial for Crazy Horse 64 years in the making … so far,” CNN, November 06, 2012, accessed October 22, 2017, http://www.cnn.com/2012/11/05/us/crazy-horse-memorial/index.html. 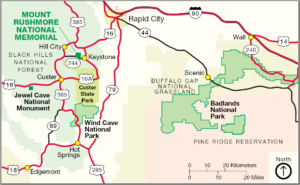 Elaine Quiver in “Crazy Horse Memorial Generates Mixed Feelings” Voice of America, October 26, 2009, accessed October 22, 2017, https://www.voanews.com/a/a-13-a-2003-09-13-7-crazy-66325922/543925.html. 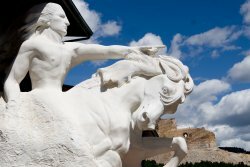 “Crazy Horse Memorial FAQ,” Crazy Horse Memorial Foundation, accessed October 27, 2017, https://crazyhorsememorial.org/faq-main.html.